This Halloween, use your culinary magic to summon a full moon made of…cheesecake! Complete the moonscape with bats made from chocolate cookies. Crush 26 of the cookies; mix with butter. Press firmly onto bottom and 1 inch up side of 9-inch springform pan. Beat cream cheese in large bowl with electric mixer on medium speed until creamy. Gradually add 1 cup of the milk, beating until well blended after each addition. Add remaining 2 cups milk to dry pudding mixes in separate bowl. Beat with wire whisk 2 min. or until well blended. Add to cream cheese mixture; mix well. Gently stir in whipped topping and 2 drops food coloring. Pour into crust; smooth top with spatula. Add a few additional drops of food coloring to top of cheesecake; spread lightly to create a shimmering full moon effect. Cut remaining 2 cookies in half to resemble bats' wings. Add candies for the eyes, securing candies to cookies with decorating gel. Place "bats" on top of cheesecake. Refrigerate at least 4 hours. Run small knife or spatula around rim of pan to loosen cake. Remove rim of pan. Store in refrigerator. Have fun decorating this cheesecake with your kids. 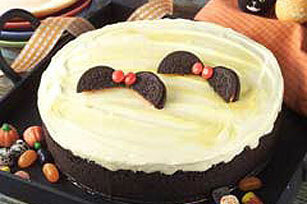 Then enjoy a serving of this spooky Halloween dessert for a special treat. For added flair, sprinkle orange-colored sugar around edge of cheesecake just before serving.